Twenty years ago, when I first began working as a trail maintenance volunteer on the ‘Jerry Cabin’ section of the Appalachian Trail with the legendary trail maintainer Sam Waddle and his trail maintenance protégé, ‘Rat Patrol’, I suppose I was in fair physical condition—not exactly ‘Superman’, but somewhat resilient, if not mostly indestructible. 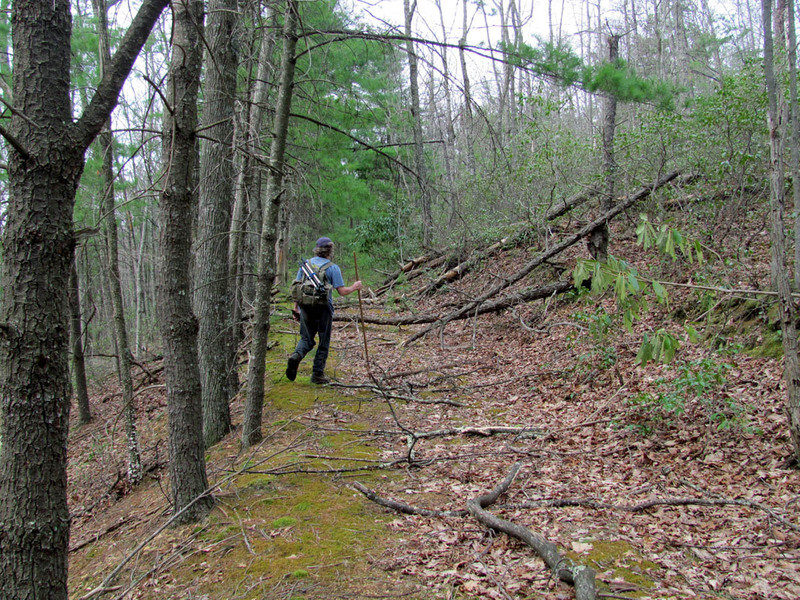 Even then, however, the aches and pains of maintaining a trail were apparent–it is hard work. Today, unlike the ‘man of steel’, I feel more like the ‘man-of-duct-tape’, as it seems I am constantly rehabbing strained muscles, sore shoulders, jammed fingers, or trying to healing some other assorted physical or mental abrasion. Having a nice trail you can be proud of is worth a little pain, I suppose, but getting the time to hike it and enjoy it is even better. My former landlord told me once that if you live long enough, you are going to have to deal with some pain, and I believe him; he lived to be 98. I suppose the theme I am searching for here is that ‘it is important to try to take care of our bodies, regardless of age’. 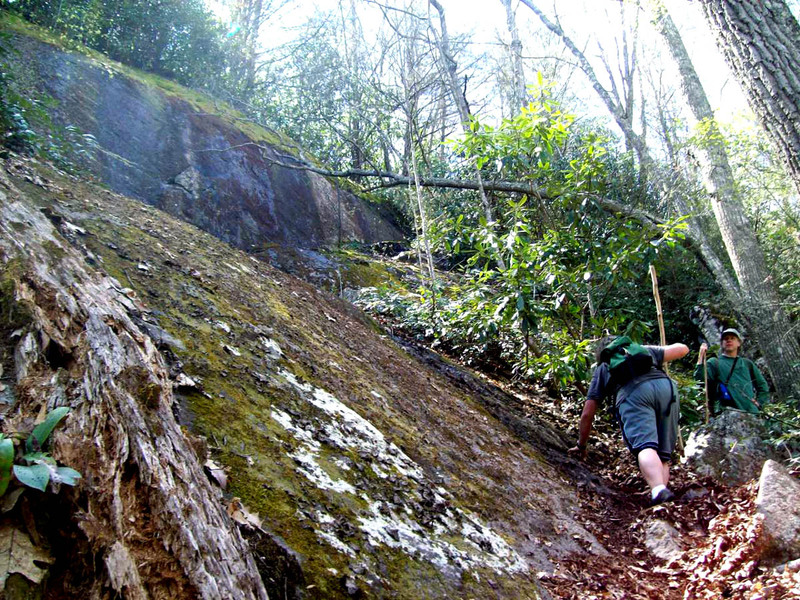 For me, hiking is a good way to get some exercise, fresh air, and possibly meet interesting people. 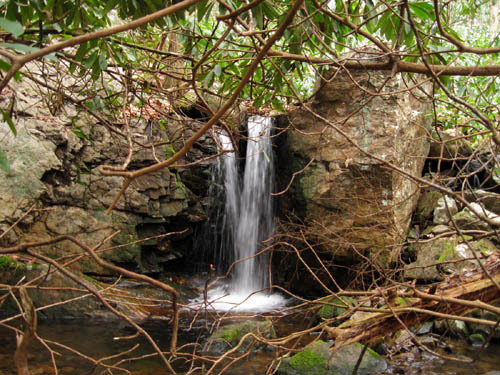 The first adventure was a trip to Simmons Branch with ‘Rat Patrol‘ and ‘Tyler’ to check out some waterfalls. Actually, it was Rat’s idea that we should go there, having scouted out the Lower Simmons Branch Falls during the frozen winter months. He had also studied the map and mountain lore of that area; all I had to do was go. 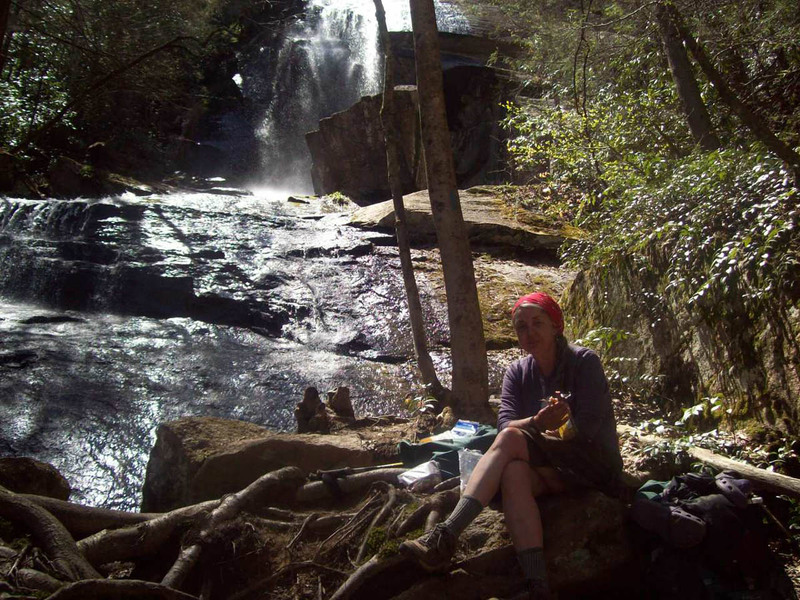 It sounded like a fairly easy, low-stress, expedition for a Good Friday morning, and since I had never been to these falls, I was quite content to let Rat lead the way. 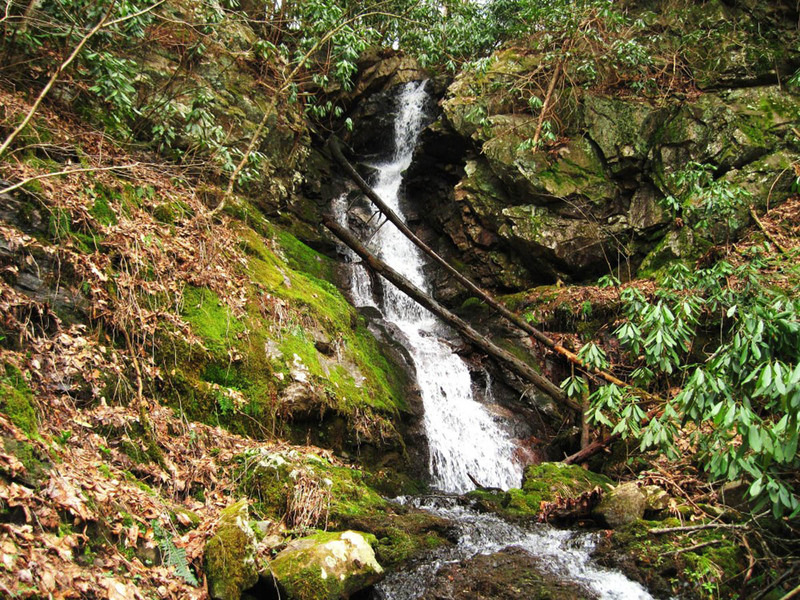 The Lower Simmons Branch Falls (35-feet) were very nice, with a fair amount of water flowing off the top and down into an interesting fractured arched-rock strata framed with moss and laurels. 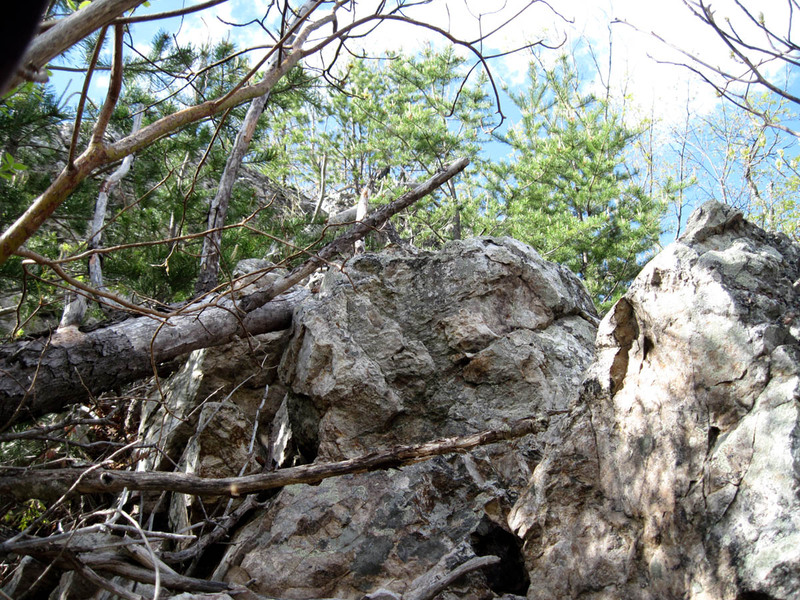 After taking a few photos, we climbed around the steep hillside on the left to the top of a prominent rock ledge, where we stopped and ate a snack. 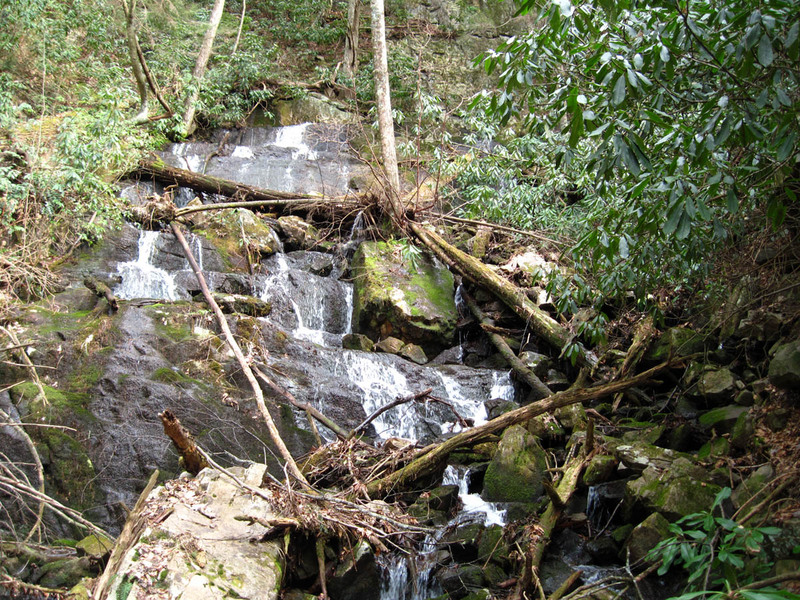 From there we followed an old road bed, which quickly disintegrated, and we found ourselves climbing down a steep embankment back to the creek, a little ways above the lower falls. The valley had widened here considerably, and the trail, following the creek, was uncomplicated, gradually ascending the valley to the fascinating Middle Simmons Branch Falls. The ‘middle set’ of Simmons Branch Falls is actually three falls in one. The ‘triplet set’, are said to be 55-feet in height, but I think they are somewhat taller. According to local legend, there was a three-tier set of falls which the Indians of this area used to bathe in; this set of three-falls-in-one resembles that place perfectly. 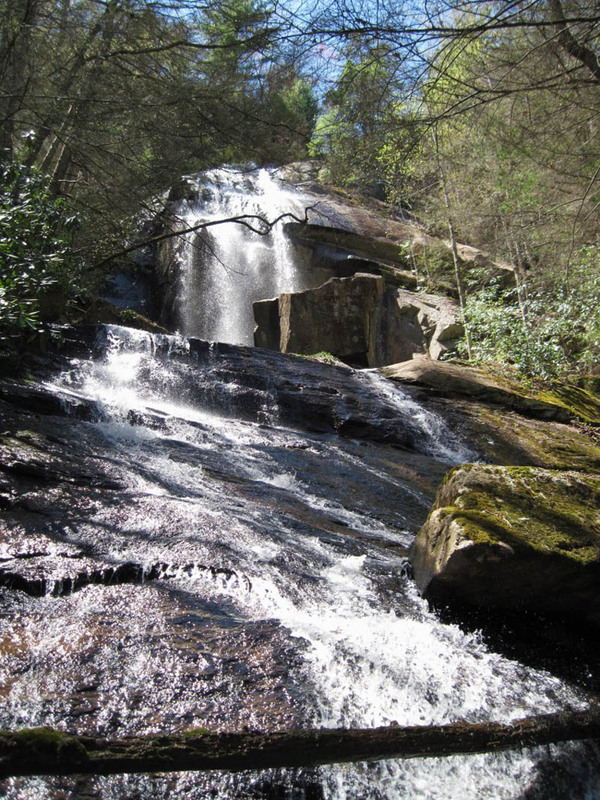 From there, it was just a short trek up the creek to the Upper Simmons Branch Falls—another very impressive (75-foot) waterfall on Rich Mountain. After resting awhile, and taking a few photos at the bottom of these majestic falls, I decided to climb them. It was a fairly steep climb, but worth the effort. 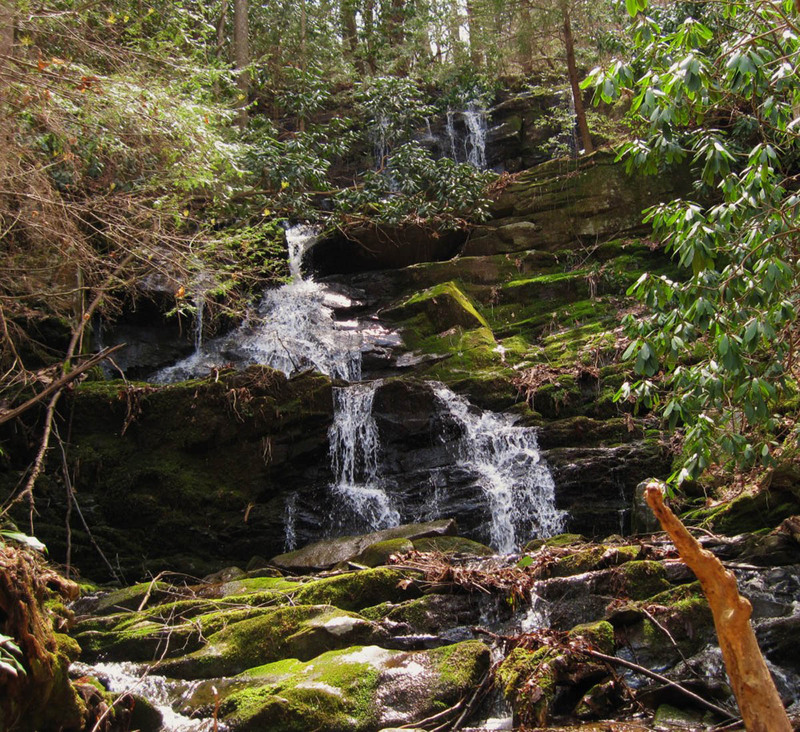 On the way back, after finding a better trail back to the old 4-wheel drive road, we located the ‘Eastern’ Branch of Simmons Creek Falls. Simmons Branch is surprisingly rich with waterfalls. 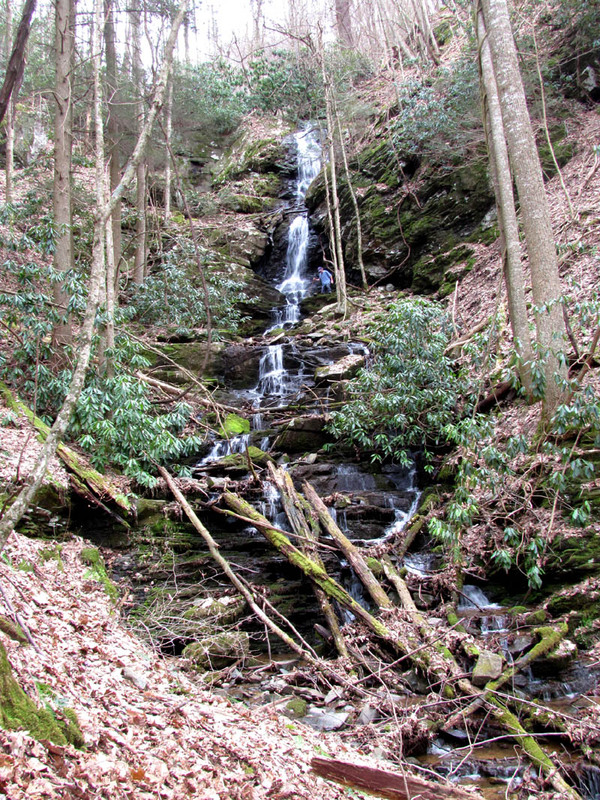 There was another ‘waterfall’ hike; again inspired by ‘Rat Patrol’ (he is very good at devising and organizing hikes). 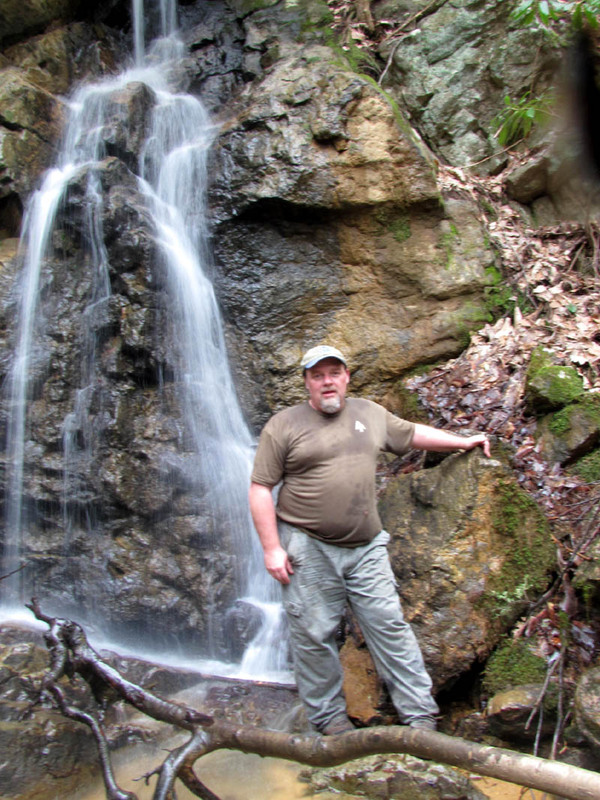 Once again, he found another waterfall in the area I have never visited—Elk River Falls. This waterfall is quite remarkable, and very easy to access (you can drive right to the top of them). 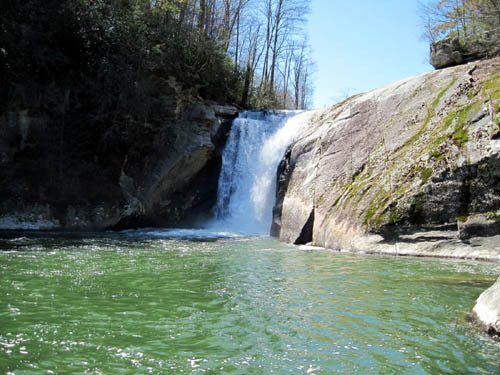 Also known as ‘Big Falls’, this waterfall is 45-feet tall and has a large green pool into which the substantial river flow drops down into over an enormous, solid rock. From there, it is only about a mile and a half hike up to ‘Jones Falls’, an awe-inspiring 100-foot waterfall. 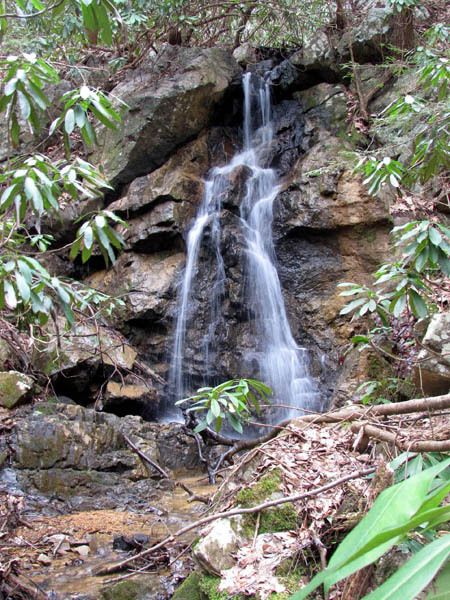 The trail to these falls is only 100-feet off of the Appalachian Trail, which passes through that area to and from Roan Mountain. 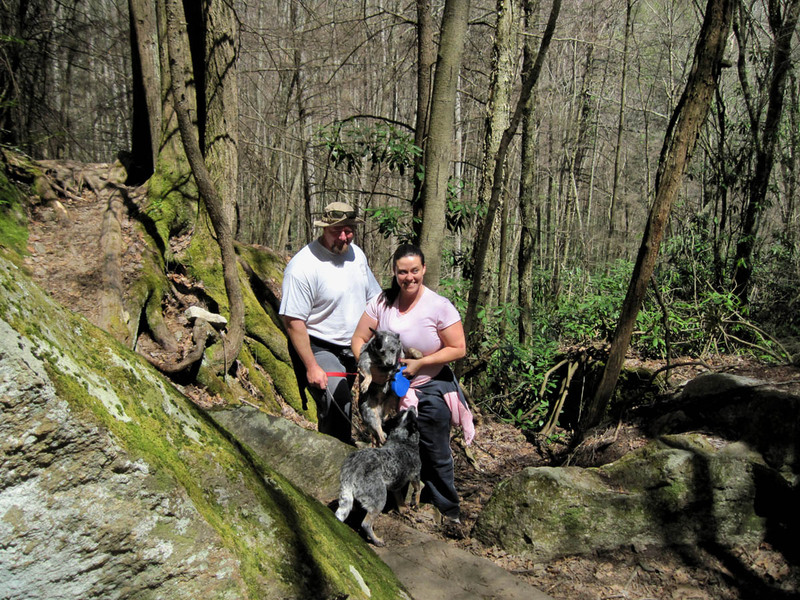 While we were there eating lunch, we met a few hikers, a nice woman hiking the A.T. named ‘Red Hat’, and a friendly couple with a pair of Australian Cattle Dogs. Rat mentioned that there was another, smaller, set of falls above these amazing 100-footers and we decided to see what they looked like. 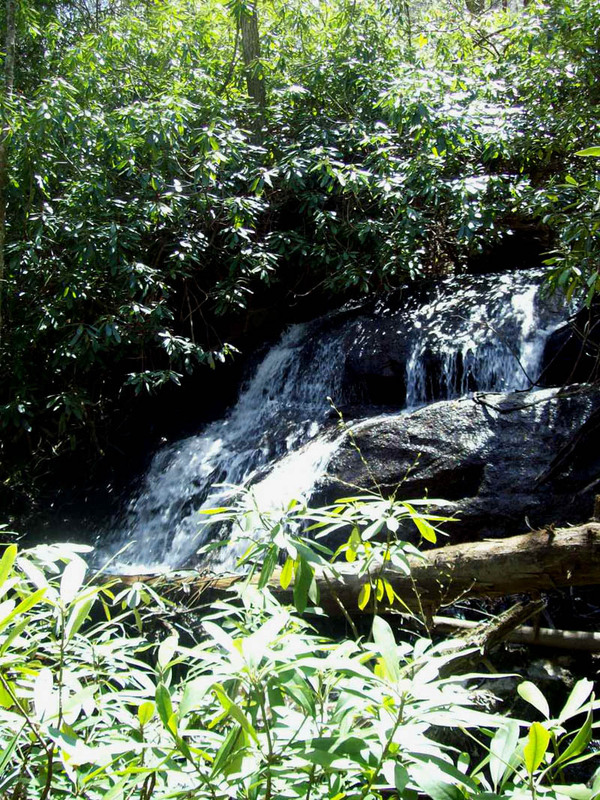 After a steep climb up and around the falls, and a bush-whack back to the creek, we managed to find these obscure cascades. 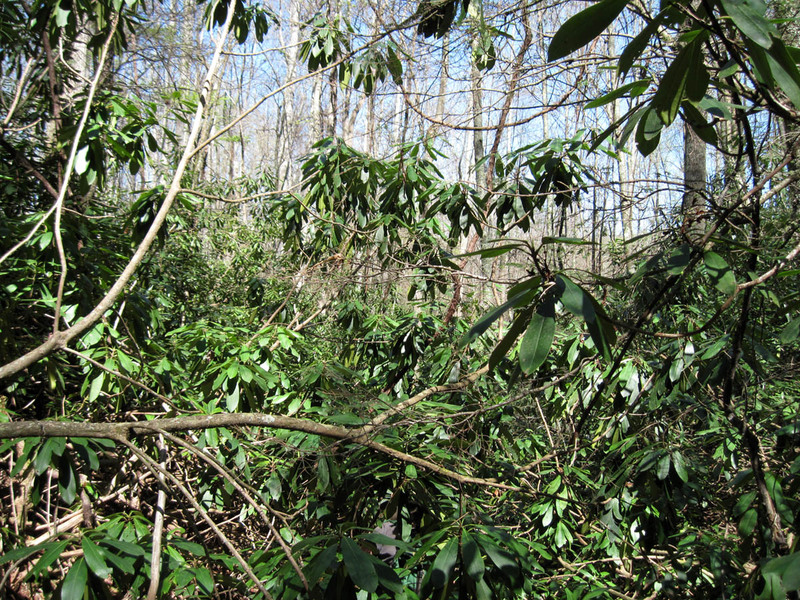 From there we decided to do a loop hike back to the car, which challenged our map skills, as the trail we were to take was poorly marked and buried in laurel hells in places. 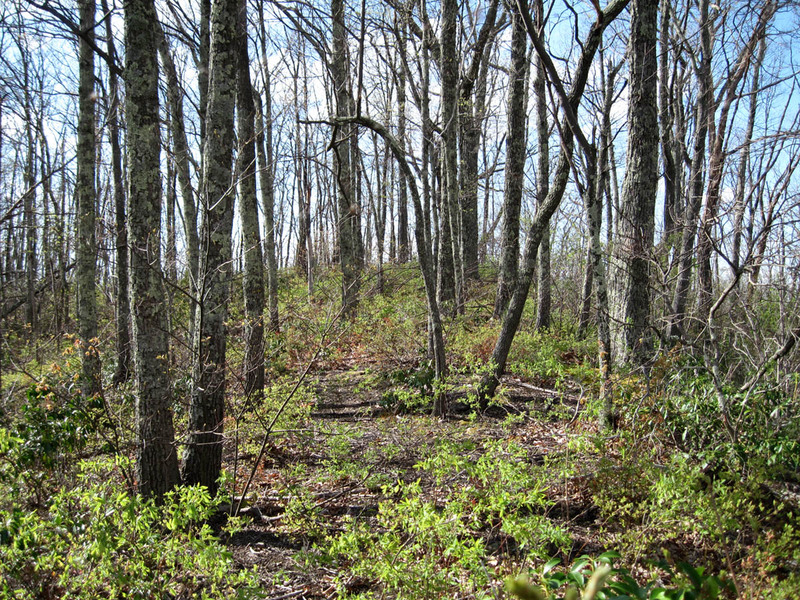 Looking back, I am not sure why I decided to climb Sampson Mountain that day. Perhaps it was indecision that put me there, or maybe it was just a bad decision. It could have been because I was bored and forgot how much pain Sampson Mountain could inflict upon someone, but in any event, my logistics were off by a of couple ‘clicks’ and I ended up scouting out an old roadbed that began leading up into, what I have been calling ‘the cleft’ in the main Sampson Ridge-line. 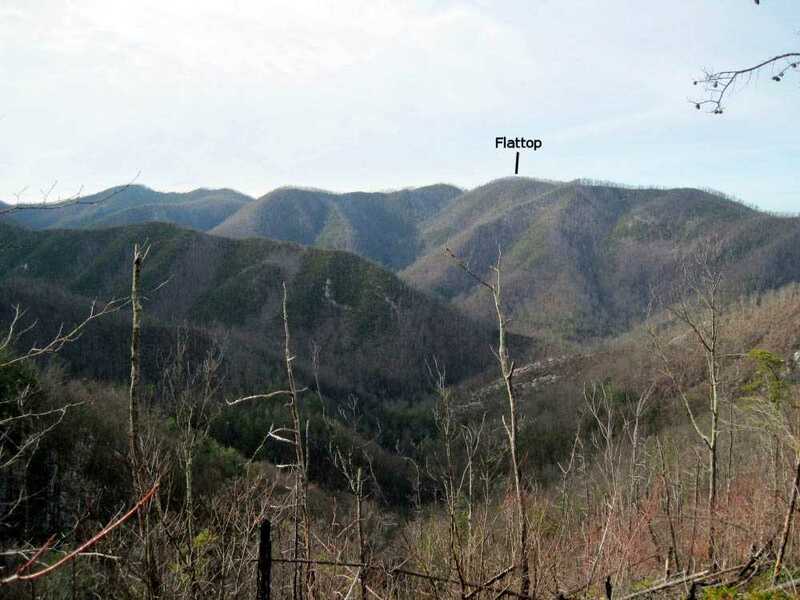 To be more accurate, it is the steep hollow that eventually cuts the gap in the ridge-top just southwest of what the genius mapmakers have labeled ‘Flattop’. Of course, ‘Flattop’, besides being a reference point on the map, is actually an exaggeration or myth, perhaps some kind of mapmakers’ evil humor. 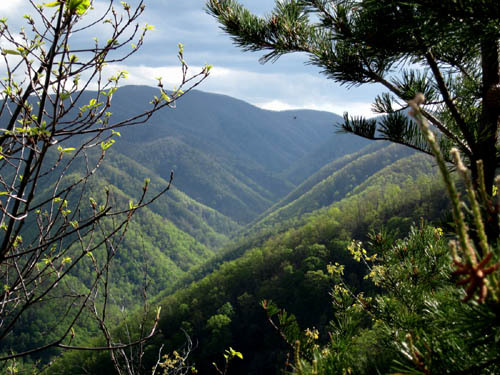 Not only is nothing around there ‘flat’, but there is also an elevation change of nearly +2200-feet (height above Clarks Creek where the ‘trail’ begins)—it is a steep climb. Starting out, the remnants of the old roadbed were clearly visible, and the terrain wasn’t very steep as yet, but before long, the road disintegrated and was just a small creek buried in laurel hells. 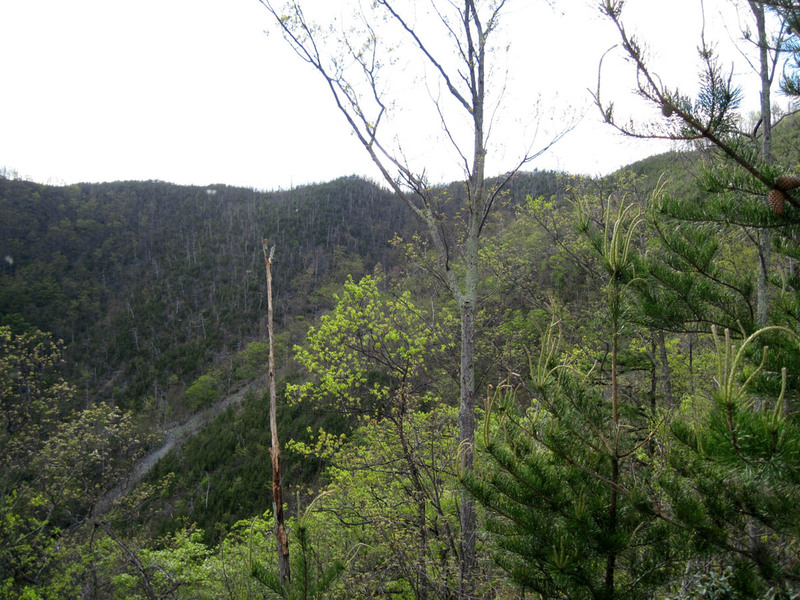 I thought I saw a seam on the point of the ridge leading up on the right side, and following the path of least resistance, began climbing the ridge. I probably should have turned around, since my legs were getting shredded by the sharp, dense undergrowth (it was a hot day and I was wearing shorts), and my arms, legs, and everything else were getting chewed up on by ‘vampire’ gnats, but the higher I climbed the more amazing the views became. 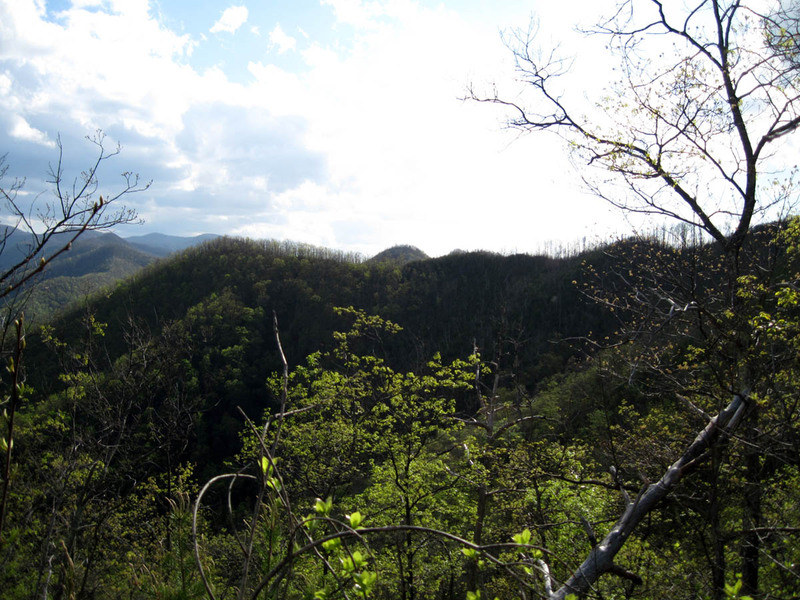 I knew it was going to be a rough hike, and was starting to feel a bit foolish and somewhat discouraged when the turkey buzzards started flying over me, but knew if I could just get to the top of the main ridge-line, there was an ‘easier’ trail that I could take back to the road on Clarks Creek. The thought of going back through what I had just climbed up did not appeal to me at all, and I eventually reached the top of the ridge, and walked it the rest of the way up to ‘Flattop’, where I could access the ridge-trail down to the top of the next big hollow. I really wanted to go over and sit on what I call ‘the big rock knob’, (a huge rock on the next peak southwest of ‘Flattop’) where the view is mostly unobstructed; I could look across ‘the cleft’ and see it shining in the Sun. However, it was late-afternoon Sunshine that was reflecting off of the rock, and I had no intention of still being on the mountain after dark. 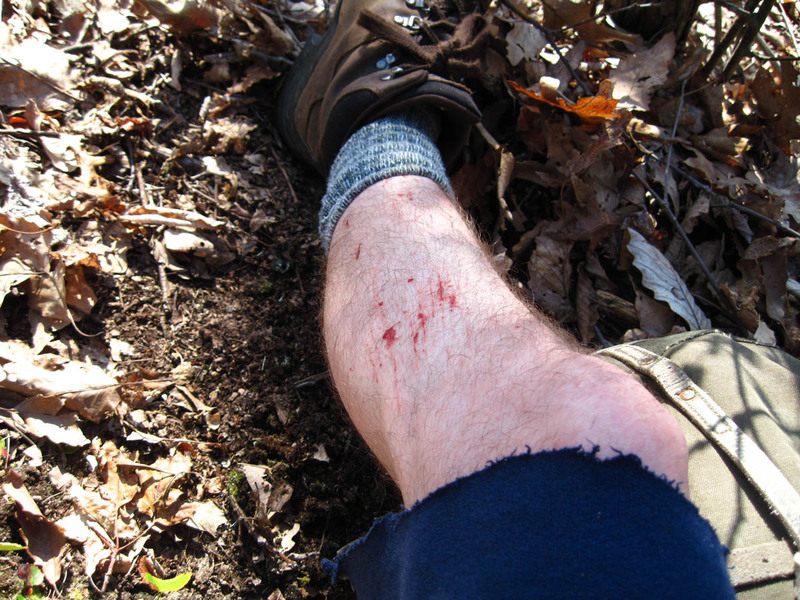 Also, my shins ached with much pain if even a flower petal were to bump into them, so I started off the mountain. The top of ‘Hell Hollow’ is an interesting place; it is a low spot on the ridge just northeast of that beastly, mythic place known as ‘Flattop’. 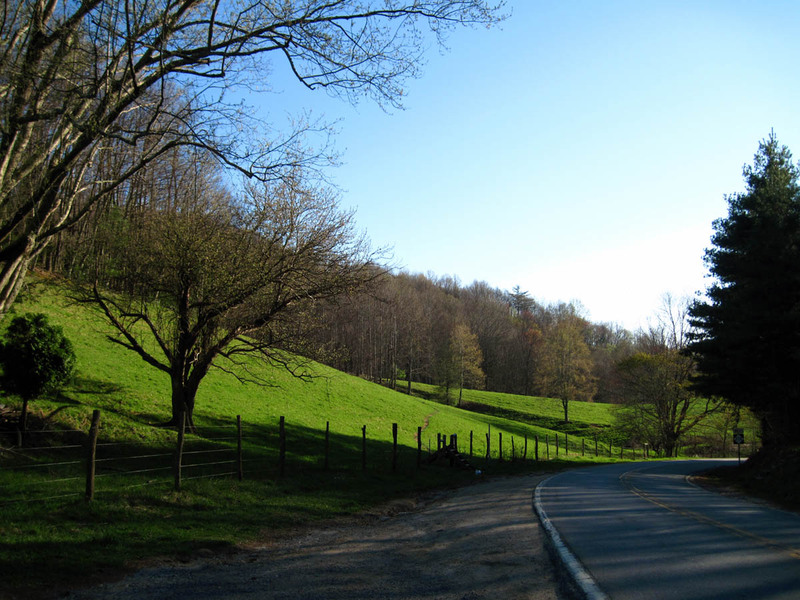 There actually is some flat area on top of the ridge, as it curves around the top of the large mountain hollow, enough for several people to camp, if they had the guts. And how could anyone forget the gnarly, old tree that stands at the top of the hollow, like the soul of ‘hell hollow’ itself. 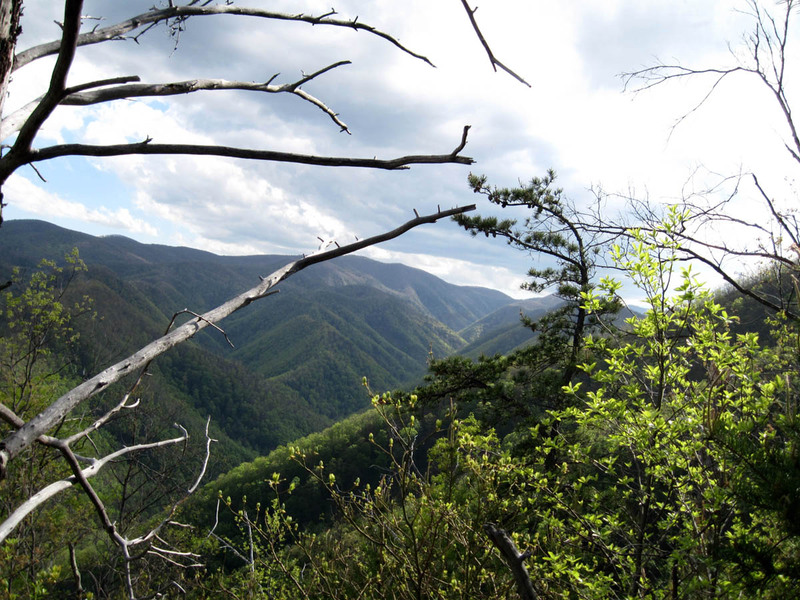 Admiring the old tree, I broke off the top of the ridge and began my descent into ‘hell hollow’, where the Sun had already set behind the tall, steep ridges. This was a real blessing, because before long the ‘bloody flying orcs’ finally called it a day and quit biting on me, and there was still plenty of residual sunlight filtering into the hollow from above. It took awhile, but I made it back to Clarks Creek without incident other than residual pain. I still had a mile of gravel road-walking to do to get back to the car; it was getting rather dark by the time I got there. 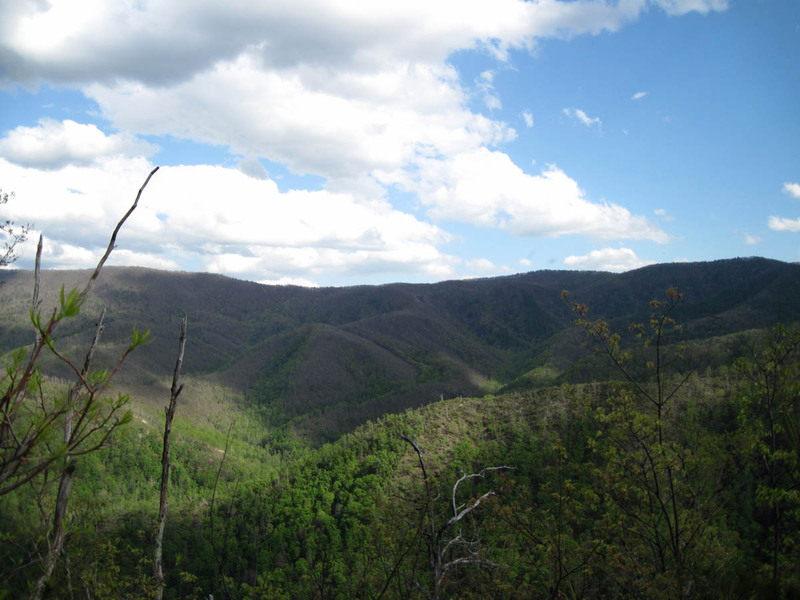 There is a pretty good chance that will be going back to the ‘big rock knob’ on Sampson Mountain sometime fairly soon, it is unlikely I will ever climb that beastly ridge ever again… though some of the views were really good. There were 3 more Appalachian Trail treks in April. 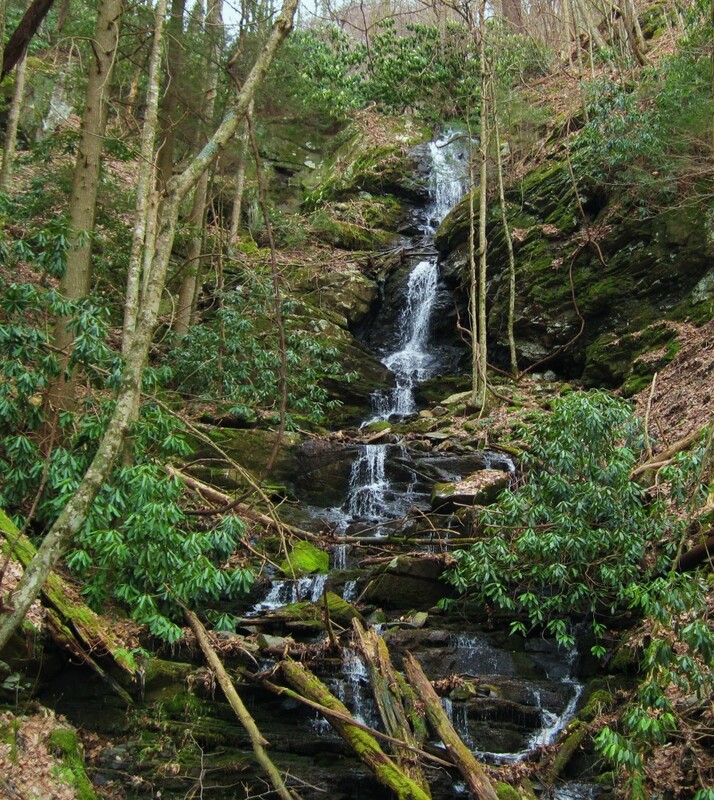 The first one was an afternoon hike up to Jones Branch Falls with one of my brothers. 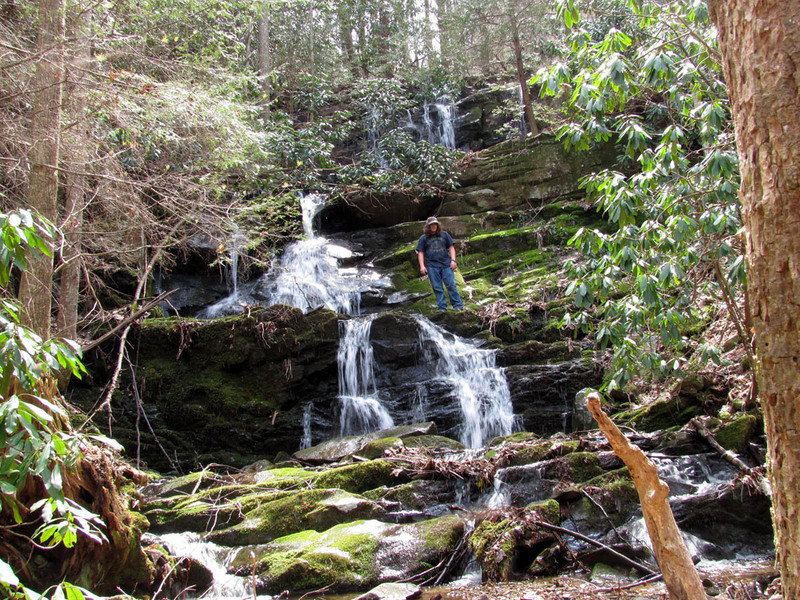 He said he had never been to Jones Branch before, and I gave him the option of whether to hike to the shelter or the falls, and he chose the falls. I told him that the trail to them was ‘a bit rough’, but I don’t think he believed me (he will next time, maybe). Anyway, the falls are always nice to look at, but obviously they are more impressive when there is a higher volume of water flowing. 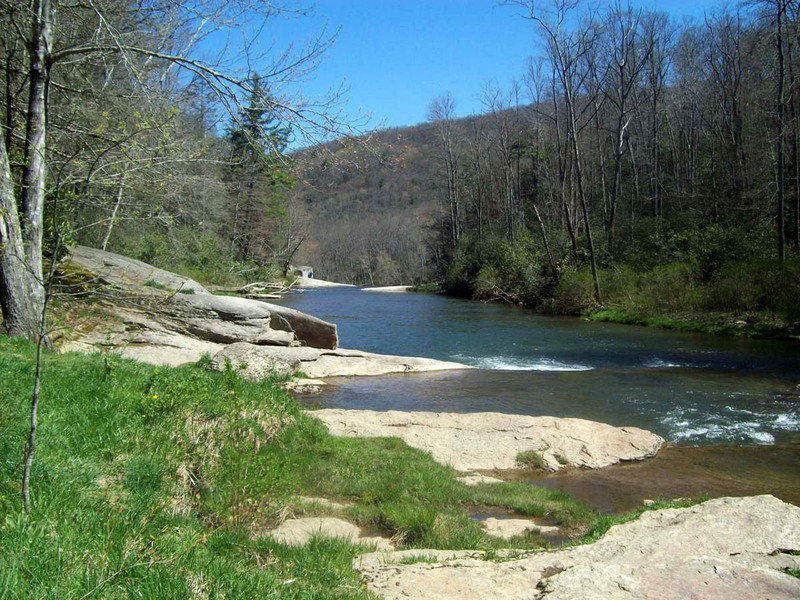 I also did a 6-mile trek on the ‘Flint Gap’ section of the A.T., and another 6-miler on the ‘Big Bald/Sam’s Gap section’. It was hot and dry nearly every trip out, and with the leaves of the trees still dormant in the higher elevations, it seemed more like August, and the threat of forest fire was substantial.